Hours: Tues – Sun: 11:00 a.m. – 3:30 p.m.
Mon – Sun: 12:00 p.m. – 12:00 a.m. 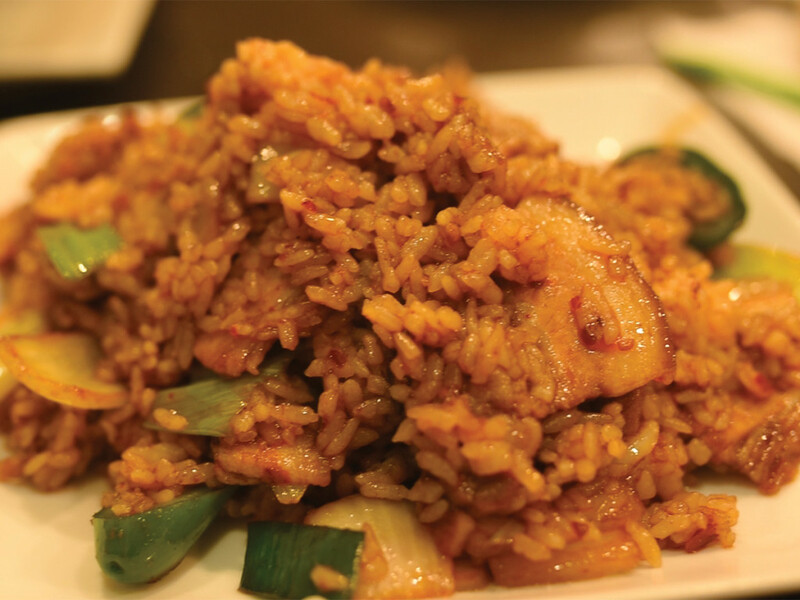 Even though some dishes were not particularly memorable nor desirable, there was no arguing that they matched the pungency and prominent flavors characteristic of Szechuan food. Whenever I pass by the University Village, I am always struck by one specific restaurant that has a name as ambiguous as its barren exterior design: Frice. Upon asking a few of my UCR friends from several different social groups, I discovered that none of them had ever frequented this conveniently located restaurant nor did they seem to know what kind of food they served. Upon further research online, I discovered that Frice hosted what they claimed to be “authentic Szechuan cuisine,” which is specific to the southwestern province of Szechuan in China that is known for its bold flavors characterized by both spiciness and heavy usage of garlic. Given that Szechuan cuisine is fairly hard to find around Riverside or for the most part anywhere else in California, I figured that now while I am living on-campus at UCR would be a great opportunity to check out this joint showcasing a less-common style of Chinese cuisine. I first observed that Frice was well-decorated, as the jasmine tea green-colored wallpaper encapsulating the restaurant was adorned with Chinese calligraphy and there were multiple picture frames holding traditional hand scroll paintings. The narrow space of the restaurant gave the impression of a hole-in-the-wall restaurant and made the atmosphere more intimate. Once getting seated (which wasn’t too hard to do since the restaurant was only fairly crowded and had around four of the approximately 10 tables open), I observed that there were no other UCR students at the restaurant. Although the restaurant seemed only moderately busy and the dishes we ordered did not seem too difficult to make (ex: were relatively small, didn’t contain any raw meat, did not require any fancy design or cutting, etc. ), the food took a remarkably long time to deliver, with our first dish — the steamed pork belly with processed vegetables — arriving around 15 to 20 minutes after we ordered it. Other aspects of the service were upsetting, such as a few of the waiters struggling to communicate through English and one of the water cups still having the remnants of a woman’s red lipstick visible. When I touched the rest of the cup, it felt like it was still partially covered in cooking oil. I expected the highly prized Chinese delicacy of steamed pork belly to be at least a large plateful of contents given the long wait time, but it turned out to be served on a medium-sized plate that I could imagine serving one person. 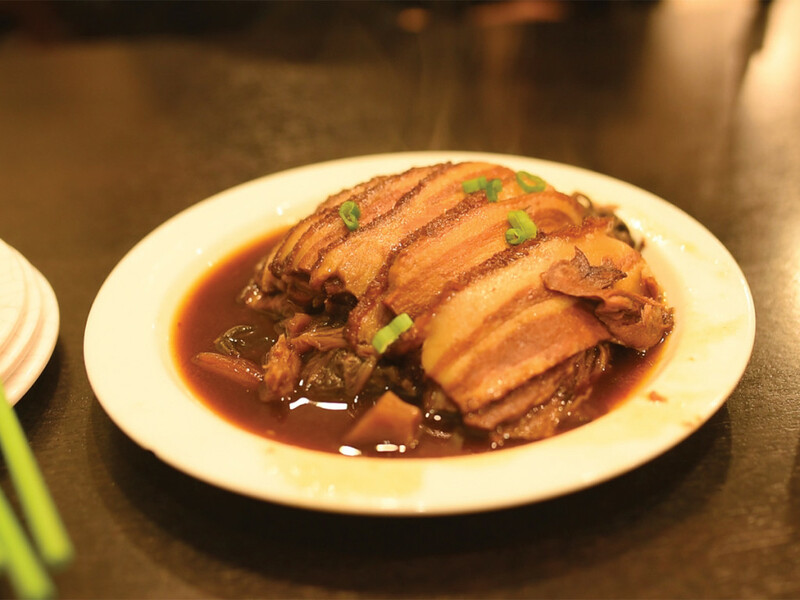 The lower-than-expected portion size of the pork belly would set a precedent for the rest of the dishes, excluding the sweet and sour soup that would arrive two dishes later. To at least get my mind off of the poor first impression of the restaurant, I dove into the steamed pork belly, which had a well-marinated, natural pork broth flavoring to it, almost reminiscent of umami-infused mushrooms, and had a nice crunch given the green onions and preserved vegetables. As always, the fattiness of the pork belly was satisfying like bacon but did not stand out from any other pork belly I had ever tasted. Within a few minutes of indulging in the pork belly, the second dish, the chili green beans, were delivered, once again being done so on a single, medium-sized plate and with a few gaps being visible between some strands of beans. The green beans themselves were not a disappointment however and even proved to be our favorite dish of the night, as they unexpectedly had a delightful peanut taste and were simultaneously tender in the center and crunchy from the tiny beans. The little chilis also added a delightful spiciness that a few of the more spice-inclined members of our Highlander video crew took a liking to in eating by themselves. If we were getting disappointed by the small portion sizes, the sweet and sour soup, containing strands of egg, strips of tofu and pieces of mushroom, that was delivered while we were devouring the green beans, counteracted these worries: It was bountifully served in a large porcelain bowl that could have served three or four people without any other food being added into our systems. It was unfortunate, however, that this exceptionally large portion size concept was not applied to a more enjoyable dish like the green beans or the pork belly fried rice that would be delivered later, for the sweet and sour soup was not especially enjoyable. As Highlander Video Editor Matthew Hong described it, “It had the aftertaste of throw-up.” It basically tasted like any other sweet and sour soup I had ever tasted, so maybe it could have been admired by someone who doesn’t mind that acidic aftertaste reminiscent of upchuck. By the time the pork belly fried rice was delivered, I was starting to develop a change of heart for the portion sizes because I was startling to get full already. Despite my stomach being partially full already, this did not cause me to enjoy the flavorful fried rice any less than I did. It was delicious in that it held a range of textures that worked well together: The rice was soft and slightly sticky, while the onions added a crunch and the pork belly a chewiness. Interestingly, the pork flavoring of the rice was more enjoyable than the actual pork belly dish we ordered first and this easily competed with the green beans for being my favorite dish of the night. Despite still being determined that the dishes should not have taken as long to deliver as they did given their fairly small plate sizes, I decisively concluded at the end of the meal that four well-rounded dishes at Frice, such as the ones we ordered, were enough to feed and fully satisfy the bellies of four ravenous college students. Even though some dishes were not particularly memorable nor desirable, there was no arguing that they matched the pungency and prominent flavors characteristic of Szechuan food. More so, the entire meal totalled up to $46.83, which was equivalent to $11.71 per person and could even be compared to a meal at McDonald’s after tax. Perhaps the reason why only a tiny percentage of the customer-constituency of Frice is that of UCR students could be attributed to it not being very college friendly (ex: no music playing overhead, no alcohol, no TV, not very customer service-oriented) or because there is not much exposure to or knowledge of what kind of food it offers in the first place. Either way, I would recommend that UCR students who are keen on trying different unique styles of cuisine or are fans of Korean, Chinese or any type of spicy food in general to give Frice a try. This holds especially true considering the fact that not every city or even county in SoCal has a Szechuan restaurant for curious restaurant-goers to try.